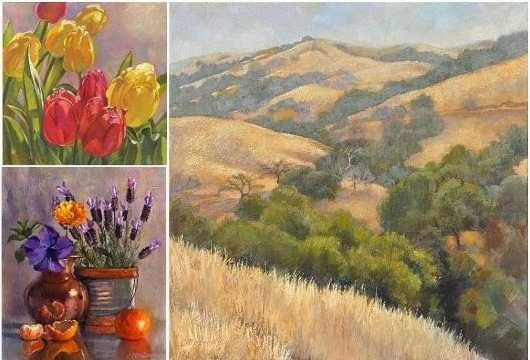 These three paintings were entered and accepted for the "Spring Obsession" show, opening March 1 at Ironstone Vineyards in Murphys, CA. I don't expect to win any prizes, but at least this forced me to put them in decent frames. March update: the hills won second place! The Opening Food & Wine Pairing Gala in Ironstone's Alhambra Music Room is always a lovely event. To see other accepted show entries in the coming weeks, visit the Ironstone Museum blog. Unfortunately this means I will not have these paintings for April's upcoming Art & Chocolate Studio Trek. With this post, clearly I am stalling for time; but I do finally have some new work in progress (really!) Which is a very good thing, because my inventory is seriously low. That recurring nightmare in which you're taking an exam or giving a performance totally unprepared? Yeah, that's me right now. Need to seriously get the lead out in the next 11 weeks.